Leaders of the Ministry of Transport, Civil Aviation Authority of Vietnam (CAAV) and experts yesterday discussed overloading at Tan Son Nhat International Airport and mechanism to speed up the airport expansion project at an online seminar in Hanoi. According to deputy minister Le Dinh Tho, the airport has the design capacity of 28 million passengers but receives up to 38.3 million passengers now. That has resulted in overloading which has seriously affected the service quality at the airport. There have been opinions saying that whether it is superfluous to pour VND11 trillion (US$473.85 million) into building Terminal T3 at the airport and an extra of many thousands of billions of dong to expand Tan Son Nhat Airport while Long Thanh International Airport will be built with the capacity of 25 million passengers. In reply, Mr. Le Dinh Tho said that air travel demand is forecast to reach 65 million passengers by 2025 and 85 million by 2030. To meet the demand, the Ministry of Transport has determined that Tan Son Nhat and Long Thanh will become a complex of airports to serve the southern key market. Of these, Tan Son Nhat capacity will reach 50 million passengers after upgrading and the first phase of Long Thanh airport will serve about 25 million passengers. In order to speed up Tan Son Nhat upgrading and expansion project, the Ministry of Transport has proposed the Government to choose Airports Aviation of Vietnam (ACV) to be investor for its experience in the field and available resources for investment. However, the current problem is the mechanism on public asset management. The ministry has reported the problem to authorized authorities for three times but it has not been solved. Mr. Lai Xuan Thanh, director general ACV, said that the most important thing in Tan Son Nhat Airport expansion is synchronicity. If only Terminal T3 is built without upgrading the airfield, it will be unable to put the new terminal into operation. Tan Son Nhat Airport is designed to handle 260,000-270,000 take-offs and landings a year. After expansion, the airport capacity will increase to 50 million passengers and take-offs and landings will approximate 300,000-350,000 a year. 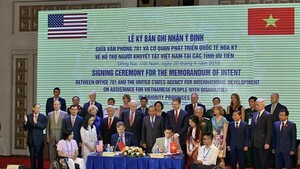 He proposes relevant sides to create a mechanism for ACV to take the initiative in planning Tan Son Nhat development investment and exploitation management. From now till 2025, ACV will accumulate about VND87.5 trillion ($3.77 billion) and an extra of VND130 trillion ($5.6 billion) by 2030. Hence, the company has financial potential to invest in Tan Son Nhat expansion project and even in Long Thanh Airport. Besides ACV, lot of investors have paid attention to building Terminal T3 for Tan Son Nhat Airport. Of them is Mr. Johnathan Hanh Nguyen, chairman of Imex Pan Pacific Group (IPP), who said that the accumulated funds of ACV should not be spent on investment but on provision and runway improvement to meet taking-off and landing demand. Calling for social investment in building the airport terminal was necessary to fuel ACV, he said. With experience in building a terminal at Cam Ranh Airport, the chairman said that Tan Son Nhat expansion will take at least three years of construction. Mr. Hanh Nguyen affirmed that his group is able to implement the project with its experience and potential if there is a cooperation mechanism. In response, the leader of the Ministry of Transport said that ACV was still the optimal choice with the company's experience and resource so it is unnecessary to call on social investment in the project. The ministry is now consulting on the Prime Minister to solve mechanism difficulties to speed up Tan Son Nhat expanding project to meet development requirement. The ministry is now calculating to reduce pressure for Tan Son Nhat airport through Can Tho and Phan Thiet airports. Specifically, flights to Con Dao Island will be transferred from Tan Son Nhat to Can Tho and passengers from the northern region will reach Can Tho instead of Tan Son Nhat airport.